Since your last couple of posts have been on MT, you might find amusing a short article I wrote a couple of years ago for the SlavFile (SLD newsletter) in which I ran the first couple of paragraphs of Harry Potter through an iterative MT gauntlet (like the automated site you posted recently, but far fewer iterations). http://atasld.org/sites/atasld.org/files/slavfile/spring-2011.pdf – oage 14. 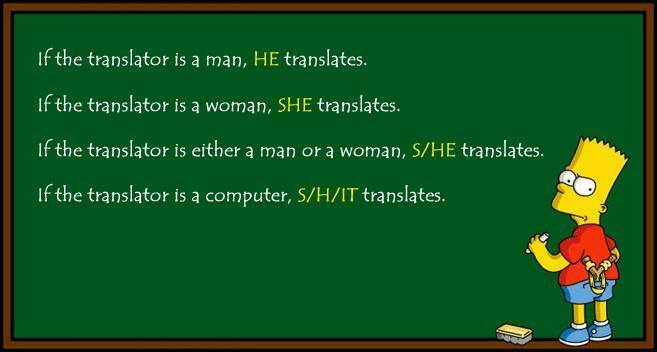 This posting also reminds me of a very lively discussion we had in a recent conference presentation about gender marking in Russian vs. English (and the annoying lack of a good gender-neutral personal construction in English). Very often it all goes to S/H/IT!! Thanks for fun posts that brighten my week! This is great! How do I (am I allowed to) post this to something like LinkedIn? Of course, I would credit you. Feel free. I got it from somewhere else too, so no need to credit me. These things tend to make the rounds.